The first change was sartorial. Whereas his predecessor, Chris Coleman, always wore a suit, Ryan Giggs marked his opening two games as Wales manager by taking to the dugout in a tracksuit. The life of the successor can be a difficult one, particularly when the man before you has overseen the most successful period in Welsh football history. But even with recent achievements in mind - and the fact his managerial mentors were Sir Alex Ferguson and Louis van Gaal - Giggs has always insisted he would do things his way. "I have to be my own man and I am," says the former Wales and Manchester United captain. "I have my own ideas, but also you want the team spirit to continue." Giggs was true to his word in his first two matches in charge of Wales. There were changes, but they were subtle. The 44-year-old could not have wished for a better start, a 6-0 thrashing of China in which Gareth Bale's hat-trick made him Wales' leading goalscorer. No matter how convincing the manner of that opening victory, however, Giggs knew Uruguay would pose a far sterner examination in the China Cup final - and so it proved. Led by their formidable attacking partnership of Luis Suarez and Edinson Cavani, marshalled in defence by their captain and imposing centre-back Diego Godin, this was a vastly experienced and skilful Uruguay side. They finished above Argentina in qualifying for this summer's World Cup and the bulk of this team contributed to their 2011 Copa America triumph, so there was no shame in Wales losing 1-0. "It was a great learning curve for the players and a great test which I thought they stood up to," says Giggs. "What I want from my team is to go to the end and I thought we did." Having guided Wales to their first semi-final at Euro 2016 - only their second appearance at a major tournament - Coleman was the nation's greatest manager, but it was not an easy ride. He was appointed in extremely difficult circumstances in January 2012, following the death of his friend and predecessor Gary Speed three months earlier. Coleman said he initially struggled to impose his own style on the team, loath to change too much with a group of young players damaged by the loss of a manager to whom they had all grown close. Giggs did not face a situation as sensitive upon his arrival two months ago, but he was mindful of the strong bond his squad had formed with Coleman over a tumultuous five-year spell which saw them plummet in the Fifa world rankings before scaling new heights at Euro 2016. "I don't have to do a lot. I have my own rules and principles, but it's about striking that balance," says Giggs. "It's about putting your own ideas across but also, if it's not broken, why fix it?" The former Manchester United captain aimed to strike a balance between continuity and change even before he named his first Wales squad. His first job was to decide on his backroom staff, and his choices embodied that balance - recruiting two new figures in assistant manager Albert Stuivenberg and fitness coach Tony Strudwick, while retaining two existing members of the team, goalkeeping coach Tony Roberts and Osian Roberts, who was one of Coleman's assistants. When it came to his team selections against China and Uruguay, Giggs found a similar balance - a nod to the past but with his own twist. "I played in the first game three at the back with wing-backs and the second game I played four at the back when we didn't have the ball and switched it to exactly the same as in the first game," Giggs explains. "For two reasons really. One, we thought it was the best way to go about making it difficult for Uruguay. "Second, we're building for the future, we don't just want to have one formation. "We want to be able to be flexible, depending on the players available and who we're playing against." Tactically, it was a case of evolution rather than revolution, after Coleman had used a 5-3-2 system which developed into a 3-4-2-1 before switching to four-man defences towards the end of his reign. Starting with what seemed a replica of Coleman's 3-4-2-1 formation, Giggs' system would sometimes morph into a 4-4-2 with a flexible midfield diamond. There were changes in selection too. Giggs recalled Rangers' Declan John after three years in the international wilderness, and the 22-year-old excelled as a left wing-back and when he tucked in to play as an auxiliary midfielder in the diamond. 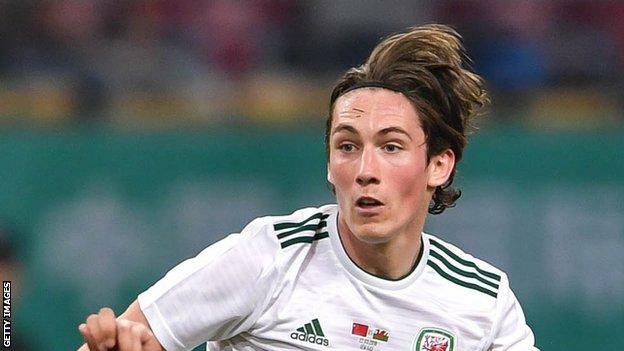 There was also a first senior start for 21-year-old Harry Wilson as an attacking midfielder, impressing with a fine goal and a clever assist in what was his only his second appearance for Wales, over four years since becoming his country's youngest international in Belgium in 2013. So were the tactical tweaks - and consistencies - purely down to Giggs, or did he consult the players? "It was a bit of both," says midfielder Joe Allen. "He has brought in new ideas and new ideas of working with it. We have only had a couple of days. "But at the same time it's a system and a group of players that are used to it, working together for a long time so the mixture of new ideas and his spin on it. "It certainly didn't look like a team that is starting a new era if you like." Giggs has a tough act to follow in Coleman, not only because of his success on the field with Wales, but because he achieved it with a charisma and force of personality which forged an almost familial connection with his players. Coleman would fire them up with what was dubbed the 'crazy game' mentality before significant matches, urging them to watch high-octane films such as Rocky and delivering rallying speeches of maniacal passion. Having suffered severe lows such as a 6-1 thrashing by Serbia in 2012, they had been through a lot together before the searing highs of Euro 2016, so it is understandable that Wales' players pleaded with Coleman to stay after failing to qualify for this summer's World Cup. Coleman, however, left for Sunderland in November and, in Giggs, Wales now have a manager with an entirely different personality. He is softly spoken, quietly considered and restrained in his body language, in stark contrast to his candid and more outgoing predecessor. Giggs is friendly and courteous enough, though he admits there are parts of his character he would like to improve, recognising he is "not a naturally outgoing person". And although Wales' players were initially distraught by Coleman's departure, they are adapting to life under their new boss. "We obviously went through a lot with the old manager Chris. It was always going to be a little bit difficult," says captain Ashley Williams. "But the new gaffer has made everyone relaxed. There's a relaxed atmosphere and I spoke to him a couple of times before meeting up, we knew each other a little bit better. "I think it has been fine. The majority of the players are the same - we just pick up where we left off really." It is a view echoed by Chris Gunter, who became Wales' second most capped player by making his 86th appearance against China. "In this case [Coleman's exit], I think we were the last to know what was going on," says the Reading defender. "But I think footballers are very good once decisions are made of buying into where you are and who's in charge. "That's normally the case, but in this one the name Ryan Giggs doesn't need to be sold to any of the players. "We're all at an age where we would have watched him as a player and know what he was like and what he brings. "In this instance it spoke for itself and that's why there's a genuine excitement of what's to come in future." Wales' squad clearly have enormous respect for what Giggs achieved as a player, having won 13 Premier League titles, two Champions League crowns and four FA Cups among others. But Giggs knows he cannot rely on those previous accomplishments as he aims to forge a similarly formidable reputation as a manager. "Your playing career can only get you so far," he says. "Then you have to do the right things when it comes to coaching. "You can't just rely on what you did in the past. You have to keep on improving, trying to be the best coach you can. "As a coach, I want to do exactly what I did as a player and prepare as best I can. "Trying to be the best I can, that's all I can do."